Yes, the weather may be warming up a bit, but you can still enjoy the exceptional satisfaction of a pasta dish whenever you get the urge. And with springtime in full bloom, you might just want to prepare a version of pasta that is a bit lighter, and also more seasonably appropriate for this time of year. So today, I will impart to you a healthy recipe that should not only satisfy your pasta craving, but also mitigate any residual guilt you may have for ingesting a few more carbohydrates. Spoiler Alert: this dish contains broccoli! For those of you who have an aversion to this cruciferous plant, please know that you can substitute any green vegetable that is acceptable to you, including asparagus, peas, scallions or even ramps. Or, if you so choose, you may eliminate the green vegetables altogether and stick with what’s left of the recipe. I think you’ll like it that way too. So bear with me broccoli-o-phobiacs, I think you’re going to love this dish. And guess what? I’ve got two really great wine pairing suggestions that should elevate the dining experience even more. 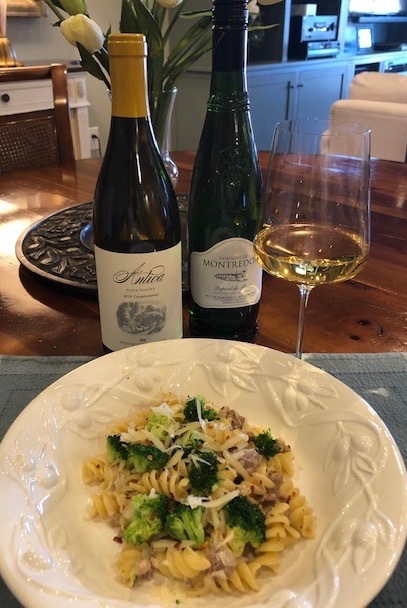 2016 Antica Napa Valley Chardonnay ($30) This Antinori family wine tastes more European than Californian with hints of ripe apple and brioche leading to a long and silky finish. Great balance and elegance and just the right hit of acidity to marry perfectly with the fusilli dish. 2017 Domaine De Montredon Picpoul de Pinet ($17) – From the Languedoc region of Southern France, this crisp, fragrant and fruit forward white has flavors of ripe pear. This wine is a lovely counterpoint to the richness of the pasta.